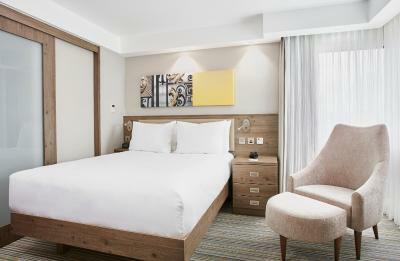 Lock in a great price for Hampton by Hilton Oxford – rated 8.1 by recent guests! Great hot shower, comfy bed, and good breakfast food. The layout / convenience of the whole hotel also the friendliness of the staff. 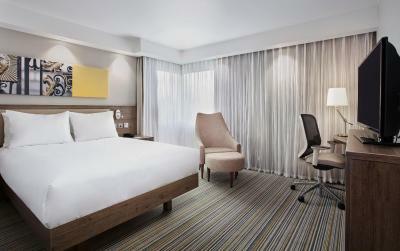 Staff were polite, room very clean and beds comfortable. Delicious breakfast in the morning. Great location, short drive from Oxford centre. Very convenient as we had a guided tour booked for next day. This hotel is great in everything don’t have much to complain at all. The room is big. Nice size of bathroom plus good bed for long drive. Great breakfast, lots of choices, friendly breakfast staff. Check out staff were very friendly. The rooms were lovely, and the bathroom was crazy nice. There was heaps of space, and everything felt really new and clean. The lighting was great. The toiletries were in those large pump bottles they refill, so there was always plenty to be had, and the linen was amazing. Breakfast was lovely, although the eggs were quite cold. 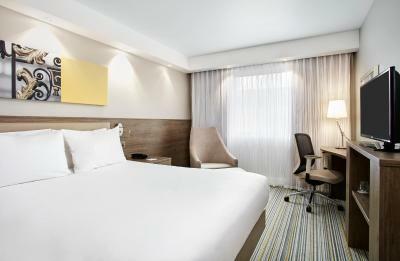 Very modern and comfortable hotel, the staff were very friendly and welcoming. Ample parking which was free. Room was very spacious and clean and comfortable. Breakfast was very good with ample choices. Rooms were very well presented, clean, and the bathroom looked almost new. Main guest areas were clean and again looked pretty new furniture. 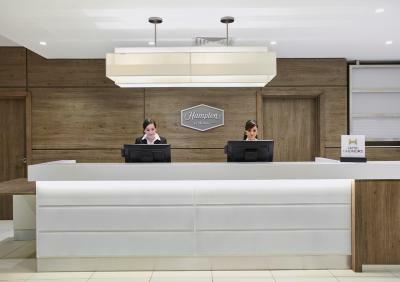 Our experience of the staff was good, with helpful Receptionist. We found the range of produce available at Breakfast (which was complimentary) very good indeed - a full cooked or, if you didn't want anything "heavy", just a croissant plus the usual fruit, etc. Impressed overall. 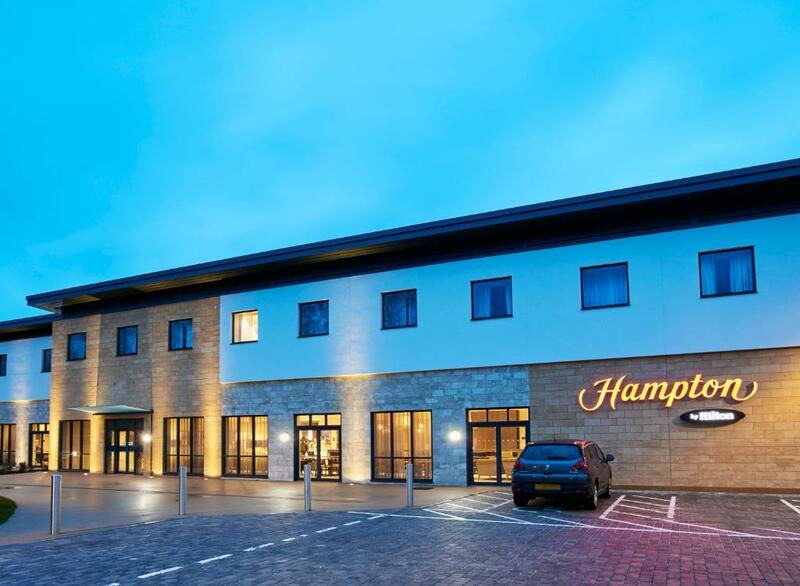 Hampton by Hilton Oxford This rating is a reflection of how the property compares to the industry standard when it comes to price, facilities and services available. It's based on a self-evaluation by the property. Use this rating to help choose your stay! 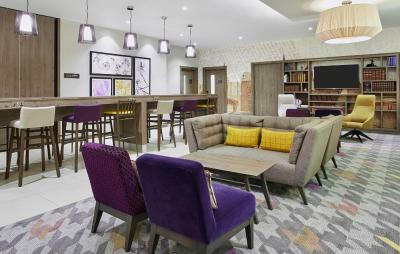 One of our top picks in Oxford.Hampton by Hilton Oxford offers business and leisure accommodations in the historic city of Oxford. Free parking and WiFi, as well as a complimentary hot breakfast, are provided for guests at the property. All rooms feature an ergonomic chair and desk, a flat-screen TV and a walk-in power shower. 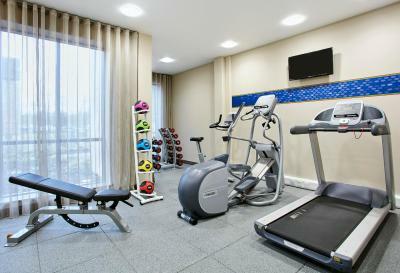 The hotel provides a 24-hour front desk for guest convenience, as well as a 24-hour fitness studio. 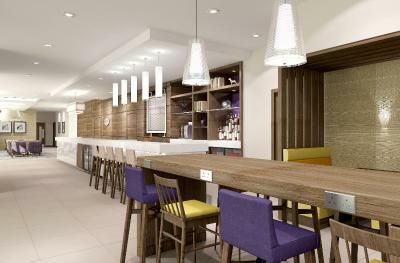 Guests can relax in the evening at the on-site bar, which serves a range of alcoholic, hot and cold beverages. 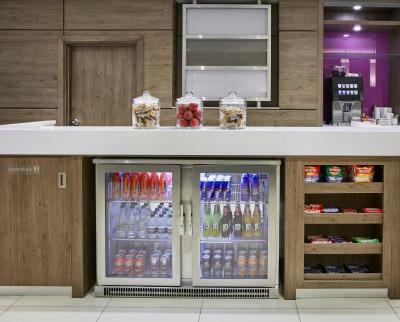 For guests with busy schedules a 24-hour snacks hub is available, which provides beverages, sweet and savory snacks, and any travel essentials that guests may have forgotten at home. 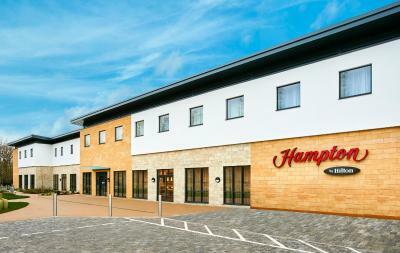 Hampton by Hilton Oxford is centrally located to explore Oxford’s historic sites and rural areas. 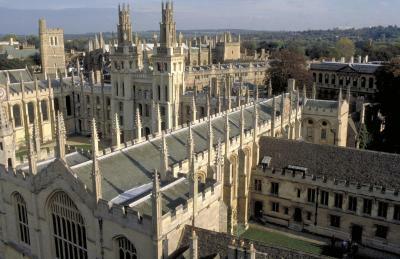 The property is 5 miles from Oxford city center, where historic colleges such as Christ Church College are located. The Kassam football stadium and conference center is next door. 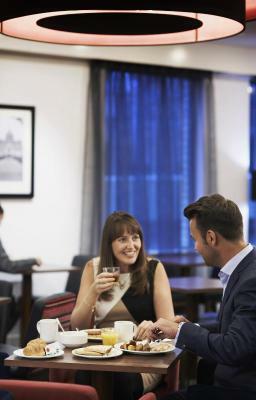 For guests that want to explore Oxford’s rural attractions, the historic villages and countryside of the Cotswolds region is 36 miles from the hotel. 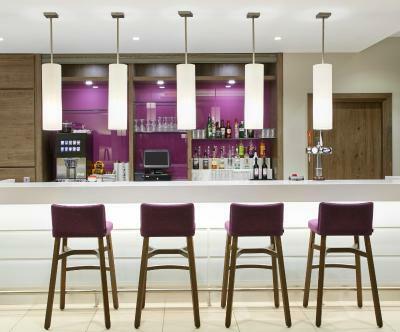 The nearest airport is Heathrow Airport, 36 miles from Hampton by Hilton Oxford. 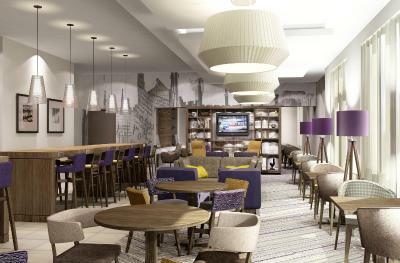 When would you like to stay at Hampton by Hilton Oxford? 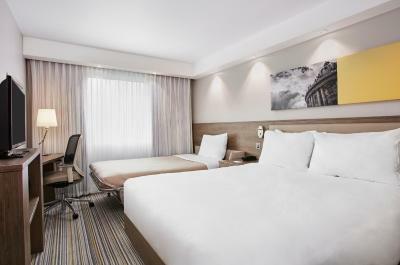 This well-appointed room features a chair and foot stool, a 32-inch flat-screen TV, a work desk with an ergonomic chair and the Hampton MP3 alarm clock and radio. There is a lap desk, a coffee/tea maker and an iron with an ironing board. The private bathroom has a shower and towels. Free WiFi is available. Sleeps a maximum of 2 people (including babies/children). Sleeps a maximum of 3 people (including babies/children). 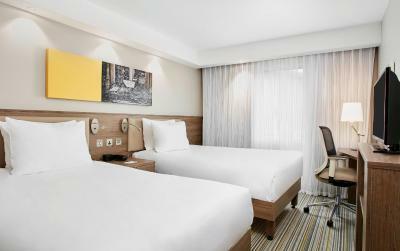 This well-appointed room features a sofa bed, a 32-inch flat-screen TV, a work desk with an ergonomic chair and the Hampton MP3 alarm clock and radio. There is a lap desk, a coffee/tea maker and an iron with an ironing board. The private bathroom has a shower and towels. Free WiFi is available. 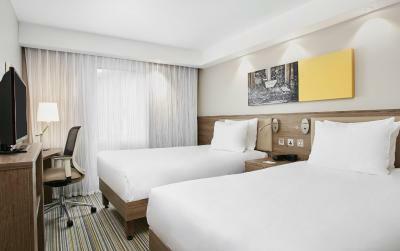 This twin nonsmoking room features two 47 in x 79 in beds, a 32-inch flat screen TV, the Hampton MP3 alarm clock and radio. 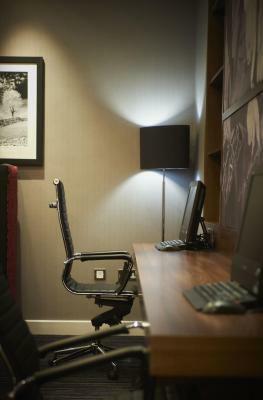 Catch up with work at the desk with free WiFi. 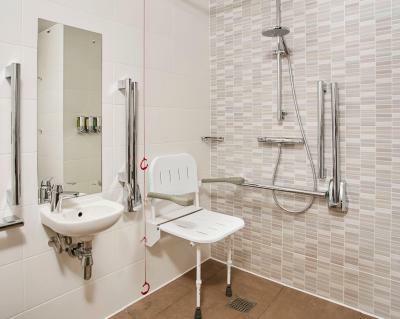 You'll also enjoy the convenience of having tea & coffee making facilities, an iron/ironing board and a laptop-size safe. 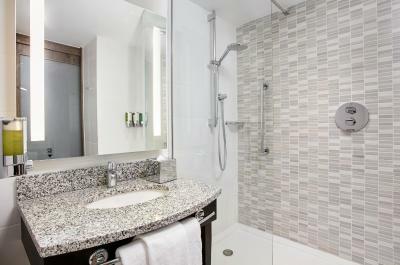 Refresh in the bathroom with a full shower, fluffy towels and bath amenities. 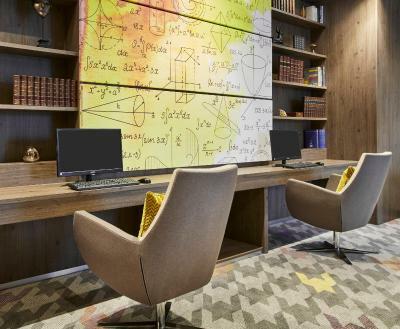 House Rules Hampton by Hilton Oxford takes special requests – add in the next step! A GBP30 damage deposit is required on arrival (around USD39.03). This deposit will be fully refunded 14 days after check-out, as long as there isn't any damage to the property. 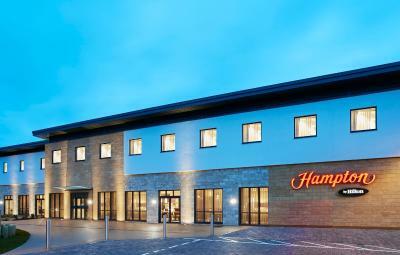 Hampton by Hilton Oxford accepts these cards and reserves the right to temporarily hold an amount prior to arrival. A damage deposit of GBP 30 is required on arrival. That's about 39.03USD. This will be collected by credit card. You should be reimbursed within 14 days of check-out. Your deposit will be refunded in full by credit card, subject to an inspection of the property. Unable to check in early. No real effort put in by staff to accommodate this request. Located near water treatment facility. If wind direction is wrong it can get a little smelly. Breakfast was good. Very clean. Just a little too far out from Oxford centre. You couldn't walk it but there are plenty of taxis and buses. Hotel was spotless. Modern clean decor. Great facilities in room. Comfortable bed. Powerful hot shower. Staff were very friendly and always attentive to your needs. Wonderful breakfast. Free on site car parking during your stay. The cleanliness and clever interior design. A couple of room maintenance issues. It's about 5 miles away from downtown Oxford, so a car ride for sightseeing/strolling in town is needed. The small parking lot immediately in front of the hotel is too small for the building. The hotel wasn't bustling, but there was no parking availability when we returned back from dinner in town around 10:30. Had to park at the nearby theater complex and walk an extra hundred yards. We initially drove past the hotel. Better directions / signs for the carpark would be helpful. Earlier check in would also have been helpful. Very clean hotel. Friendly staff. Good breakfast. We thought the food let the hotel down. The cooked breakfast was adequate but not amazing. Very friendly and helpful reception staff. Nothing was too much trouble. Thank you. The room was very clean and comfortable. Restaurants & Vue round the corner. Brilliant! Uncomfortable with not being able to open a window overnight. Need fresh air when sleeping. All very good as already stated above!